Easy! Just add a bookmark and visit often! We check the best UGA news, blogs and information sources every 30 minutes so you always have the latest and greatest in Bulldog Nation. You convinced me, but how do I go about registering? First thing to know about GATA News Net is that everything is managed through the Slider Panel at the top of your page. Click the "Log In | Register" link or the + icon to slide the panel down. The 3rd column of the Slider Panel is titled "Not a member yet? Sign Up!". Simply type in your desired username and an email address to register. If that username is taken, we'll let you know. In a matter of seconds you should get an email from us giving you your temporary password. Click the link in the email or open your GATA News Net bookmark. The temporary password we provide you is intended to be just that ... temporary. We'll let you continue to log in and manage your account with this password, but we'll keep asking you to change it until you do. And that's it. It's just that easy to get registered with GATA News Net! OK, I'm registered. How do I manage my settings? First step is to make sure you're logged in. Once logged in, the Slider Panel will reveal your User Menu. You can choose to update "My Info", "My Premium Site Subscriptions", "My Favorite Sites" and even "Suggest a new Site" in the top right corner. GATA News Network is a University of Georgia and SEC Football fan web site and is in no way affiliated with the University of Georgia, the SEC, or its Properties or Organizations. This site is for informational and entertainment purposes only. 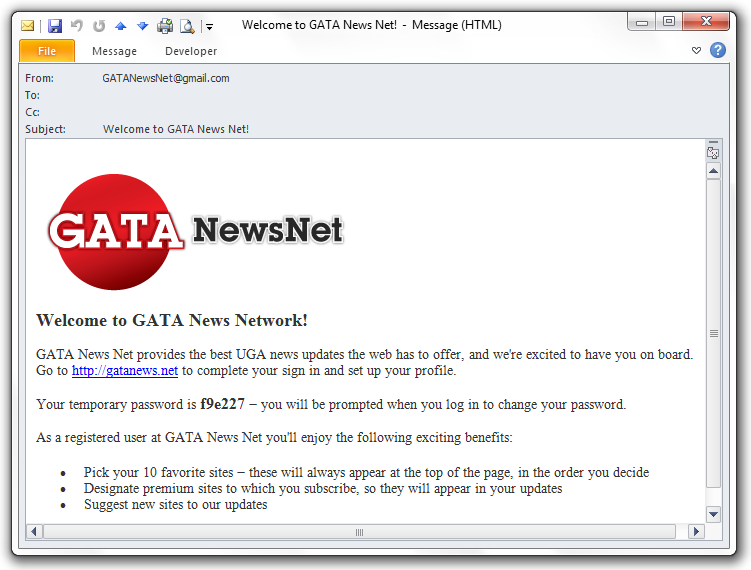 GATAnews.net is not an official web site for the University of Georgia.